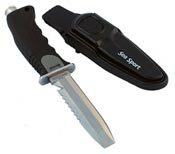 Sea Sport Knives - Divemar inc. Distributed exclusively in Canada by DIVEmar inc. Knife 4.5" duel edge blade with blunt tip,line cutter, black handle, hard sheath. Straps included. 420 stainless steel. Knife 4.5" TITANIUM duel edge blade with blunt tip,line cutter, black and grey handle, hard sheath. Straps included.